Hi ,my question is about the German Shepherd dogs . I do like Solid black & Red&Black ,but according to a neighbor, only Rede&black ,Red & tan & Black & grey are the colors of a pure German Shepherd . According to Him White only. Solid Black & other colors are disqualified .Thank you for your answer . Comments for What colors do German Shepherds come in? 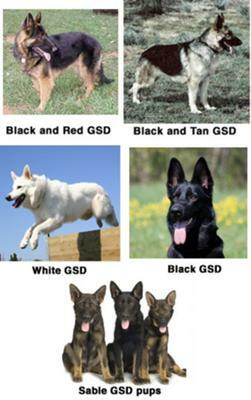 The solid black GSD is acceptable as are many other color combinations. It appears that the AKC does not accept all white GSDs but come other countries' clubs do. In some places the White German Shepherd is a breed apart from the GSD. But no kidding, many web sites, including this one, can give you a list of acceptable colors, hair length, nose color and other characteristics along with info about unacceptable ones. I wonder where your neighbor got his info. Just because A GSDs coat color isn't Black & red or black & tan doesn't make the dog any less pure bread. I own a silver & black female and she is just as much a pure bread as any of the more common colors. The only way a dog would be disqualified is if you were going to enter it into an AKC dog show. If that were the case... the dog would have to be either black & red, black & tan or black & silver. anything other than that would disqualify it. Your neighbor would be wrong. Sorry. German Shepherd coat colors and patterns may include any of the following: black & tan, black & red, black & cream, solid black, solid white, (considered a conformation disqualification), sable (also called agouti or wolf gray, in various colorations), black & silver, liver (rare - conformation fault) and blue (rare - considered a conformation fault).